After two days the PowerPoint files stretches to 84 slides. As they tested the slides in the auditorium they realized it was most effective when each slide included just two lines of text. This way the audience could just glance up and take in the text at a glance with minimum distraction from the performance. 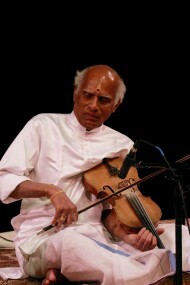 Kaladharan would advance the slides during the performance. 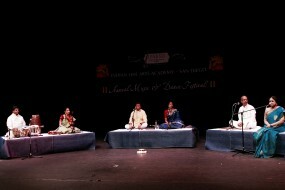 The audience would be able to take in the subtext and watch the performance while the artist on stage repeats each abhinaya sequence two or three times to the accompaniment of a recorded soundtrack of the chenda, the maddalam and the manjira. This was the plan and they all hoped it would work. I arrived on the afternoon of the program and at the professors’ home. When I was told about the “PowerPoint” they were going to use and I was quite skeptical. I didn’t really see how this could be done without detraction and dumbing-down the audience experience. I was quite perturbed and was prepared to write the whole thing off as another American experiment; well intentioned, but a recipe for disaster. When I get to the auditorium and see the first slide being tested my fears are confirmed. I silently hope for the best. The auditorium soon fills up until every seat is taken. There are even a good number of students sitting on the floor just in front of the stage. 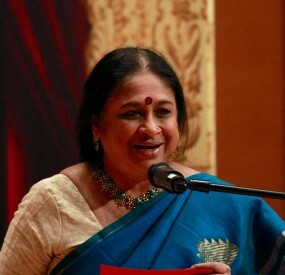 The two faced Kuthivilakku is lit with one flame turned to the artist and the other to the audience. The performance begins. Shanmukhan in full regalia of kathivesham is revealed from behind the Thirasseela. I barely notice the text softly projected high above on the stage backdrop. Kaikasi is seen caressing the baby Ravana. The tender scene unfolds and Kaikasi rocks the child in her arms. As the complexity of the story line evolves I find myself glancing up and reading the superscript and soon find it is a part of my experience. Far from being a distraction, it helps me understand much more of the performance than I would have unassisted. The audience, which includes the students who have participated in the workshops, is drawn in further. Even those who had not been to the workshops could comprehend and enjoy the nuances of story line. 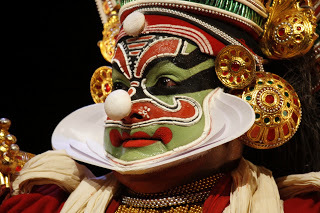 Kathakali was no longer just a visual experience. It was also an intellectual challenge and remarkably subtle. 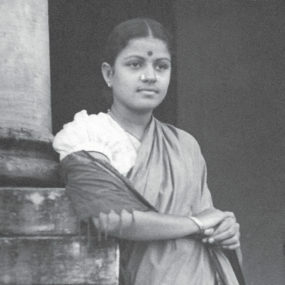 Ravanodbhavam was perhaps an ideal play for this approach. An innovation inspired from Thorana Yuddham from Ramanattam which was a precursor of the present day Kathakali. The play by Raghava Pisharoti is a departure from the usual depictions of Sri Rama and his exploits. Here is Ravana presenting clues to his character in his own terms. Why and how he came to be so powerful, his motivations, his passion and his sense of filial duty are all explored through the story of his penance. Despite himself, Ravana displays his pride and growing arrogance as he struts like a peacock upon receiving each boon from Brahma. This arrogance and the fatal mistake when he demands and receives what he thinks is the boon of immortality comes across as the essential tragedy in his life. A single dancer who masterfully portrays Kaikasi as well as the ten headed Ravana, Shanmukhan even brings Brahma down on stage as we see Ravana conversing with him upon culmination of his terrible penance. Without any vocal music and no climactic battle scene, Ravanodbhavam relies heavily on the abhinaya to convey the story. The only prop is a simple wooden stool. As the students congregate excitedly after the program many can be overheard discussing the papers they were going to write about this performance as this was one of their assignments. I wished I could read these papers to see what these students were able to take away with them from the intensely emotional spectacle of tenderness, innocence, horror and tragedy. The artists with some of the students and faculty after the performance. 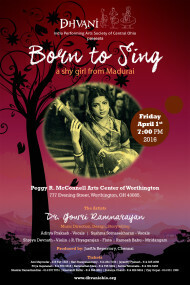 The next day the same program is presented in another mid western city; this time to a smaller audience made up mostly of South Indians. 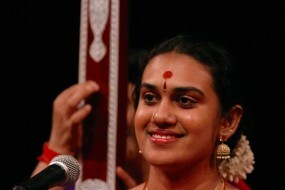 For some this was their first exposure to Kathakali and others had been to several performances. The same superscript is used here as well. The program seemed to flow even better the second time. After a standing ovation nearly every member of the audience is heard commenting about the superscript and how it made the program so much more meaningful and enjoyable. We can only hope that this innovation will be repeated by others and used with restraint. 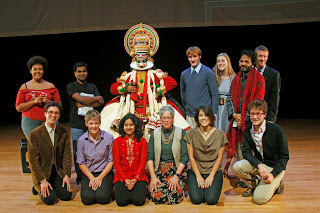 Whether they earn the sobriquet superscripts, subtitles, supertitles, foot notes or backdrop notes; short phrases effectively written in English and/or Tamil and Malayalam may be just what Kathakali needs to make it accessible to present day audiences in India and abroad. This could very well rejuvenate audience interest in this remarkable art form. Superscripts have several advantages over extempore introductions. They are less intrusive. The content can be carefully written and polished over time. The effect is not dependent on the speaker. The artist can focus on performing. My fervent hope is that bilingual superscripts will catch on at Bharathanatyam recitals as well. I can only dream that this will happen in my lifetime. I wish to be able to see a program without the intrusive convent school introductions before each segment. I find these are usually poorly written, simultaneously jarring and intrusive. Superscripts may well be able to address the need to engage the audience in the story line in a much better manner. It puts the audience in control of when they seek to take in the explanations. Done bilingually, superscripts can reduce the impact of the disconnect in English translations. Let us hope it catches on.